A Big Shot and Lots of Dies! It had to sit like this for a week until Sami & I could play! Yep. Tonight was play night! A big box arrived exactly a week ago! Oh my! 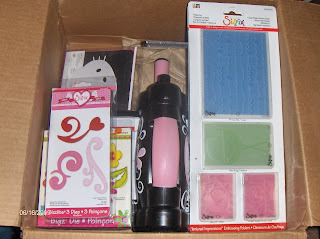 Check out all the goodies that were in that one Box! Tons of stuff! So so so fun! My gosh... Sami and I just started playing about an hour ago. Those embossing plates are fun!!!!!! And my gosh those cutting dies really cut! So where did this box of goodness come from, you ask? 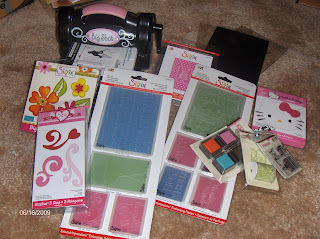 This is from my huge big win on the ever so generous Simply Handmade Blog. That's a link to the post that announced my big win! And Thank you again, Northridge Media! You won again!! Congrats Andi - love seeing your name in lights! Andi that is SO cool! I'm sure you and Sami will put this little baby to good use!! OMG, Andi!! Love at all those goodies, enjoy!! So happy for you!! Can't wait to see what fantabulous creations come out of this box of goodness. Hey! You got it! I read the prize announcement...Congrats! Everything looks great! My, my, my!!! Congrats! You'll love the Big Shot! Wow!!! Lucky you! BTW, I LOVE LOVE your photos!! !